Maxillaria striata backcross #1198 ('Yellowstone' AM/AOS' x '0327') (approximately 25 seedlings per flask). 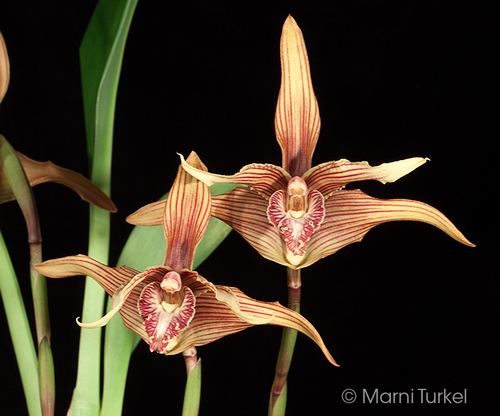 The Species: Maxillaria striata is found in Peru, Ecuador and Colombia. This particular plant is from Ecuador. It is found at elevations between 5000 to 7250 feet in shady locations. This is a spectacular species not often encountered and 'Yellowstone' is a very fine clone with large flowers that was crossed with a seedling from a previous outcross. Culture: Grow in moderate light, year round water, dilute fertilizer with cool-intermediate to cool temperatures. I water this plant more frequently than most plants and rarely let it approach dryness. It grows well for me in a bark mix. 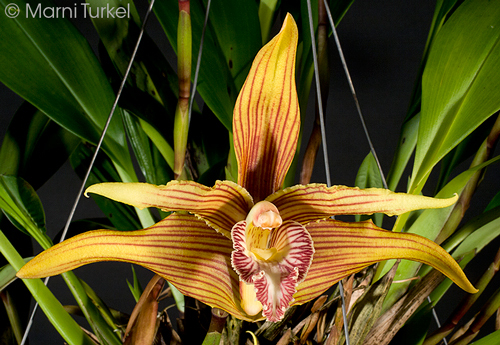 The flowers are usually upright, it will sometimes bloom down, so it is frequently grown in a basket. 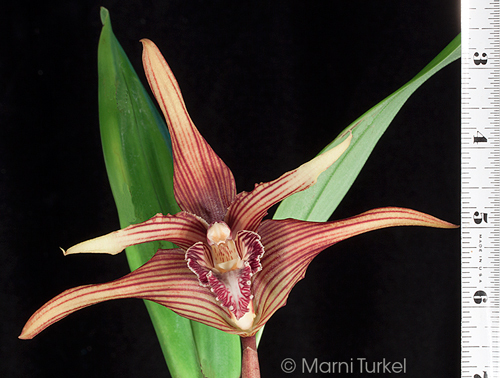 Pollen Parent: Maxillaria striata '0327. This is a seedling that used 'Yellowstone' as one of the parents. This first bloom was 5.75" wide.